Timeless. That is just one way to describe Grammy nominated recording artist Johnny Gill. Many have gotten to know him for his hit singles like "My, My, My","Rub You the Right Way" and "Where Do We Go from Here" (with Stacy Lattisaw) as well as his involvement with the popular groups New Edition and LSG, however, there seems to be no substitute for the man himself. Well, with the new project GAME CHANGER released this year the wait for Johnny Gill fans is over. Giving music lovers his heart in each and every track, he is letting it be known that he's not done yet---and there is much more to come. Singles like BEHIND CLOSED DOORS and GAME CHANGER conjure up all of the reasons why Johnny Gill fans can't get enough of his voice and the message he sings about, and it is that loyalty that keeps him moving forward. In our conversation I had a chance to ask about his journey in music, the lessons and what he has to say to his fans. "I have been blessed with a gift from God that is magical. You can't design it," Johnny said to me. "I think about my career and how my music has touched people. It is beyond a miracle and a blessing. To have people to connect with you is a gift." Like many other soulful singers before him Johnny Gill began singing in the church and blossomed from there. He believes the main reason he is still able to do what he loves is because he understands the importance of staying consistent. "I stay true to me and my music," he says. "If you look at my body of work you'll see that I'm open to trying new things. At the end of the day my biggest goal is to always stay focused and be careful that I don't lose who I am. I set out to make great music, songs I can identify with and connect with and do it justice." Remaining true has given him the confidence to say that in spite of it all, he has put his heart and soul into each and every project. "I have something to hold my head up about and be proud," he says. That comes from walking in his musical truth. His beginnings were not so full of pride. Johnny relayed to me how when he first started in the business at the age of 15 he was not always the best of himself. "There was no blueprint about how you are supposed to be and act," he told me. "All the things you have to learn growing up in this business---the ups and downs that come with it---now make me blessed that I have my fans there for support." He understands that it is all a process, a machine that brings it all to life. The process that gets his music to the masses is something he feels more connected with, and he knows it's important not to take any of it lightly. To his fans, Johnny says this: "Thank you. Know that I don't take you or my success for granted. I couldn't have done this without you. " Johnny Gill's GAME CHANGER is available on Amazon here. Stay in contact with him on Twitter at www.twitter.com/realjohnnygill. His website is www.johnnygill.com. It was about 14 years ago that I first recognized the phenomena force that is Viola Davis. I was watching the show City of Angels, and she brought the character Nurse Peeler to life. Fast forward a couple of years and she played a major role on one of my favorite shows Law & Order: Criminal Intent making us love and loathe the woman who was Terry Randolph. We would get to see more of Davis on the show Law & Order: SVU as the tough as nails attorney Donna Emmett, in many ways foreshadowing what she has brilliantly done with the character Annalise Keating in the Shonda Rhimes' produced hit HOW TO GET AWAY WITH MURDER. Couple her success on television and movies (like Doubt, The Help and this year's Get On Up) with what she is doing with her company JuVee Productions, and there is no wonder why Conversations Magazine is proud to recognize Viola Davis as our first-ever Entertainer of the Year! Ms. Davis is the epitome of what hard work, passion and consistency will get you in life. She also shows men and women that you can not just benefit from the doors open to you but you can create opportunities for yourself and others to thrive. The other thing that she highlights that is a great reminder is the importance of forging real relationships with people. She has done this with fellow actors and actresses as well as those who are writers, producers and directors. As soon as I saw her as Annalise in HOW TO GET AWAY WITH MURDER I couldn't stop smiling. This was the role that was not just tailor-made for her artistic gift but her passion for great storylines. Regardless of what profession you are in, we can all learn a thing or two from Ms. Davis. When you give your all and trust in your God-given abilities your talent will always make room for you. Stay connected with Viola online at www.twitter.com/violadavis and her company Juvee Productions at www.juveeproductions.com. Place the orange slices in a large mixing bowl. 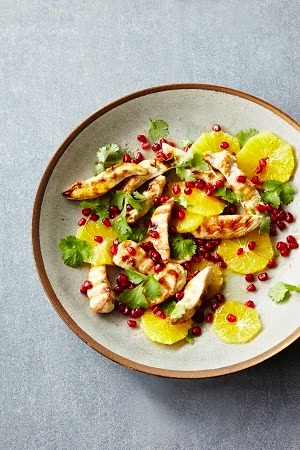 Add 3 tablespoons of the olive oil, plus the lemon juice, coriander and pomegranate seeds. Toss well to combine and set aside to marinate while you cook the chicken. Heat the remaining olive oil in a non-stick grill pan and sear the chicken over high heat for about 3 minutes on each side, or until cooked through. Turn off the heat and set aside to rest for a few minutes. To serve, divide the salad between 4 serving plates, top with the warm chicken slices and finish with a few grinds of black pepper. Stay connected with Chef Daniel Green on www.danielgreen.tv. Get his new book The Paleo Diet on Amazon here. Heat a large, non-stick pan over high heat and add the salmon- If you have a good-quality, non-stick pan, there should be enough oils in the salmon to cook it without the need to add any extra oil. Cook the salmon for 3-4 minutes on each side. Meanwhile, make the glaze. Place the honey, mustard, lemon and ginger together in a bowl and stir to combine. Set aside. When your salmon is just about cooked, spoon the glaze over the top, then take off the heat. The glaze will carmelise in the hot pan and turn the salmon sticky and brown. To cook the cabbage, heat half the olive oil in a wok over a medium heat. Add the cabbage and stir fry for 3-4 minutes, then add the remaining oil and cook for another 5 minutes, tossing all the time (if you need more moisture, add a drop or two of water). Add the garlic and sesame seeds and cook for a further minute. 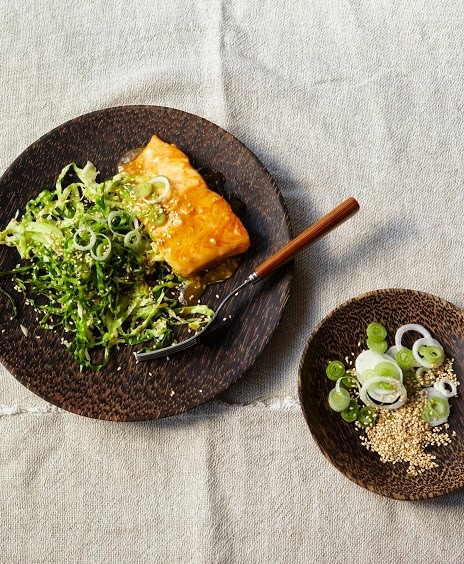 Turn the cabbage out onto a plate, season with black pepper and top with the glazed salmon. Scatter the spring onion over the top and serve with a few extra sesame seeds. Stay connected with Chef Daniel Green on www.danielgreen.tv. Get his new book The Paleo Diet on Amazon.